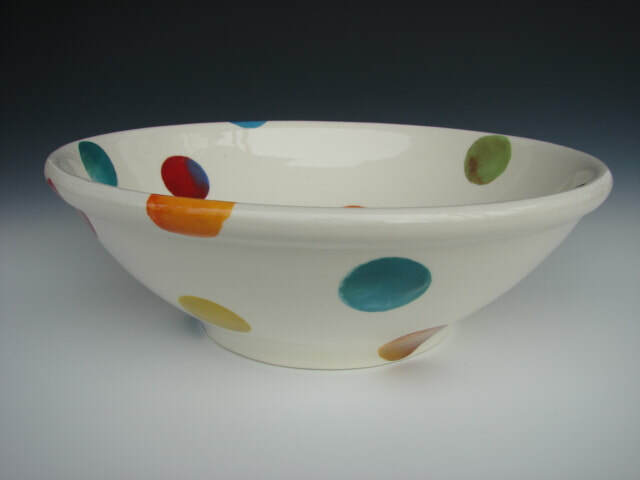 The big multi coloured spot range is fairly new and fairly popular. I am doing a standard salad bowl size quite regularly and some large Platters and Flat Salads as well. There are jugs in a couple of different sizes and shapes and mugs where the spot is reduced in size to be in proportion with the mug. This range is special in that each spot is blended and every spot on every item is unique meaning that no two jugs , bowls or mugs are the same. As with all items please contact for availability as it not uncommon to be a bit sold out . Roundy , Multi Spot Jugs. Cream and White.